While the annual Costume Institute Gala at the Metropolitan Museum of Art remains the hottest, most elusive, most impossible-to-attain ticket in town, there is one way you can get closer to the action this year. Vogue.com will, once again, be live streaming the red-carpet arrivals. Our coverage will kick off at 7:00 p.m. and will be simultaneously streamed on the websites of Moda Operandi, Samsung, and the Metropolitan Museum of Art. The Costume Institute Gala (or Costume Institute Ball), known as the Met Ball or Met Gala, is an annual ball that celebrates the annual opening of theMetropolitan Museum's (The Met) fashion exhibit at the Costume Institute. [ The red carpet evening where celebrities arrive dressed to impress is described as the fashion industry's "Night of Nights". Fashion industry experts and style magazines consider the event, which is hosted by Vogue, to be the fashion world's best red carpet event. 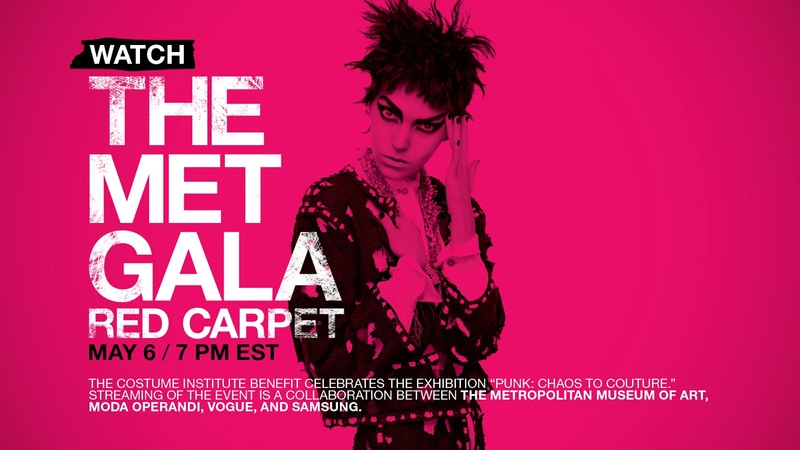 It is regarded as the top annual social event in New York City The event has been an annual affair at the Met since 1948 (the year in which the Costume Institute was founded), but it has been held in different parts of the museum over the years. In 2005 individual tickets ranged in price from $5,000 to $15,000, while corporate sponsors paid $150,000 for whole tables.In 2006, the event raised a total of $4.5 million. In 2010, the price of the top table was $250,000. Vogue editor-in-chief Anna Wintour oversees both the benefit committee and the guest list, although Vogue staffers help assemble the list of celebrity invitees. For over ten years, ending in the late 2000s, Stephanie Winston Wolkoff was the special-events planner at Vogue in charge of seating. Robert Isabell designed the event for over a decade prior to his death in 2009. Vogue and Chanel have shared the cost of the event. Each year the event has a theme,and the evening includes a cocktail hour and a formal dinner. The evening Rivals the West Coast's Vanity Fair Oscar Party, which is said to have more "star power", but less fashion panache. [ The Oscars parties have more Hollywood people and press representatives.